Happy Halloween to those of you who celebrate! Chocolate chocolate chocolate is what I hope my kids score tonight! I can't believe tomorrow is November! The holidays are upon us now. The year has really flown by, and there is so much to do. Is anyone else already feeling stress? Anyway, there are lots of challenges this week that I wanted to participate in as always, but I've been bogged down with readying myself for classes this weekend, so I thought I would show a small project I did for Make N Takes last month, which happens to qualify for all the challenges I want to participate in. How convenient! ;0) Compendium of Curiousities II Challenge is "Kraft Faux Suede" from Tim's book pg. 40, which is also being sponsored by The Funkie Junkie. Simon Says Stamp & Show's challenge is "Just Add Pearls", Sunday Stamper's challenge is "Autumn", and Artistic Outpost's October Referral Challenge is "Anything Goes". This is a real acorn cap from my MIL's tree. I've never seen any like this before her tree. 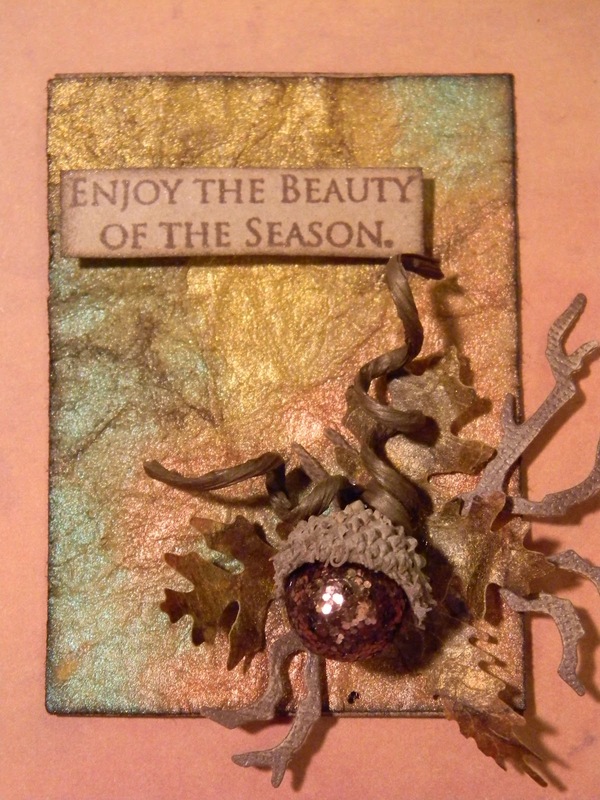 The idea for the acorn comes from the marvelous Shelly Hickox. I still have a few of these kits left, and have been thinking about offering my extra kits at a lower price here on my blog. If a few people are interested I will do that. Just let me know. I hope your hands get creatively dirty soon, especially with the Holidays so close at hand! Your background is fabulous! I love that it is not in the usual brown 'leathery' tones. I think the simplicity is perfect to show off the background. Fun, sparkly acorn! Beautiful! What a fantastic background. The colors are so soft...like looking at autumn hills on a misty day. Just the right amount of shimmer, too. The acorn is darling....you are such a clever gal! 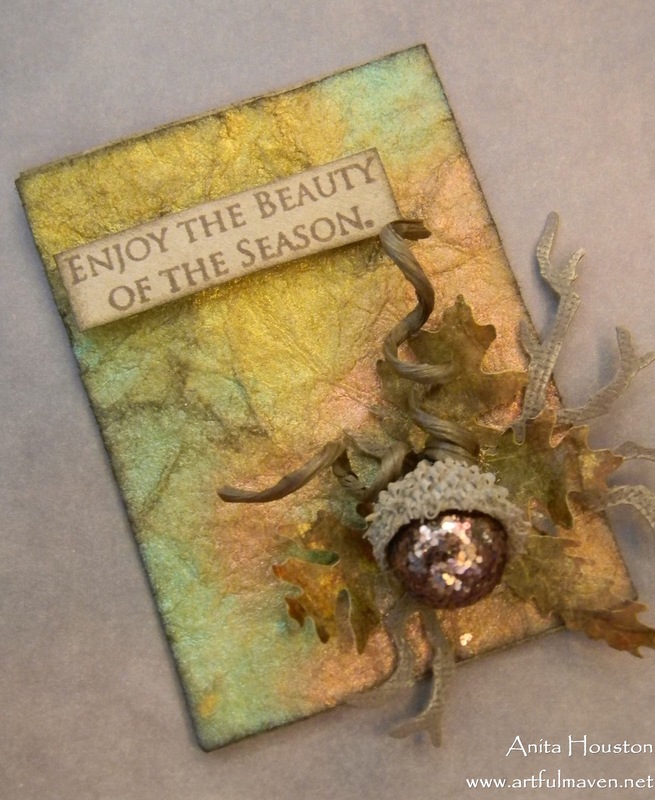 I'm working on holiday journals for my family...so off to the studio I go. Have a glorious and creative day, Anita! Beautiful Anita! The simplicity is awesome and the acorn!! Too awesome!!! A keepsake to cherish when the last leaf has fallen and snow decides to blanket them. I love what you've created here Anita. It's fall to perfection! This is lovely and makes me feel ready for the holiday season. It is soft and beautifully simple. Love it. Very pretty - love the acorn spray! This is so pretty! The colors soft, pearly...just really, really pretty! Anita, this is so beautiful!! You just took this technique to a new level! Love it! "Boo"tiful ;) I love that little acorn technique, brilliant! Love your colors and the warm fall feeling - nice one! It is so beautiful. I love that! The background is really stunning fantastic colours. Beautiful! Love the added acorn! Thanks for supporting us at Artistic Outpost! Gorgeous ATC. I love the background & the acorn is beautiful. I am still in awe that the faux suede technique actually feels like suede too! One of my faves and works so nicely with the fall themes. I could envision bowls full of those adorable acorns! 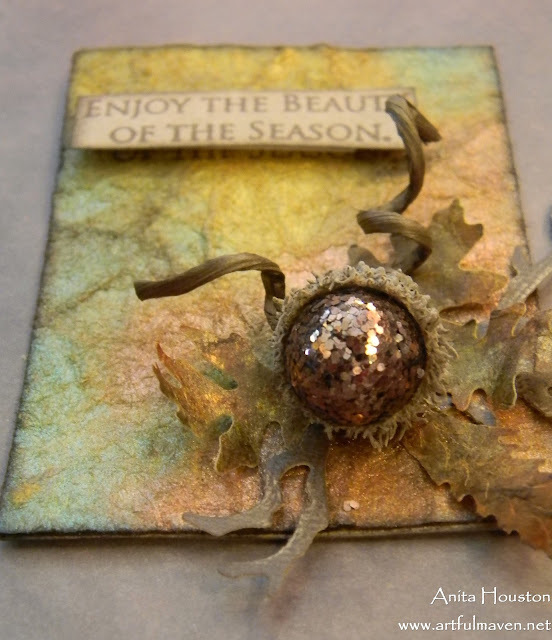 Totally awesome - LOVE that acorn treatment with the glittery pearl. Just an all-round lovely fall piece, Anita! Super cute project, Anita! I love how you've "gussied" up the acorn...it's so proud now!! This piece makes me happy. The background is gorgeous and that acorn is so beautiful. Love the twiggy bits around it. Just stunning! I would be interested in a couple of these kits. It just says autumn joy! That acorn is stunning! Very elegant ATC. I love that little acorn! I have collected some caps and want to try it too. What a fabulous background for that super duper acorn Anita, everything has combined to make some real eye candy - better than chocolate lol. This really is fantastic! Love the sheen and the richness of it all! Beautiful background Love that suede! and I'm so feeling like the holidays are creeping up way too fast also! Beautiful!!! Love how you used a real acorn top!! That acorn is exquisite! A really beautiful piece. thanks for your sweet comments on my blog, too. Just lovely! The faux suede looks so real and the acorn is stunning. Anita, what a beautiful ATC!! It really captures the sense of fall! xo Evie P.S. I think I know why you liked the images(details) on my blog post...they kinda looked like atcs...? ?